Keith Hearnshaw was born in West Bromwich and began learning the Organ at the age of thirteen. He spent four years at the Birmingham Conservatoire where he studied Organ with David Saint and also with Mark Shepherd at Lichfield Cathedral. While studying in Birmingham, Keith held the position of Organ Scholar at St Chad’s R.C. Cathedral, under John Pryer. He was later Assistant Organist at St Columba’s Parish Church, Sutton Coldfield with Richard Mason, and toured Germany with both of these choirs. In 1991 he was a prize winner at the Oundle International Organ Festival and in 1993 was awarded the Leonard Gibbons Memorial Prize by the Birmingham Organists Association. 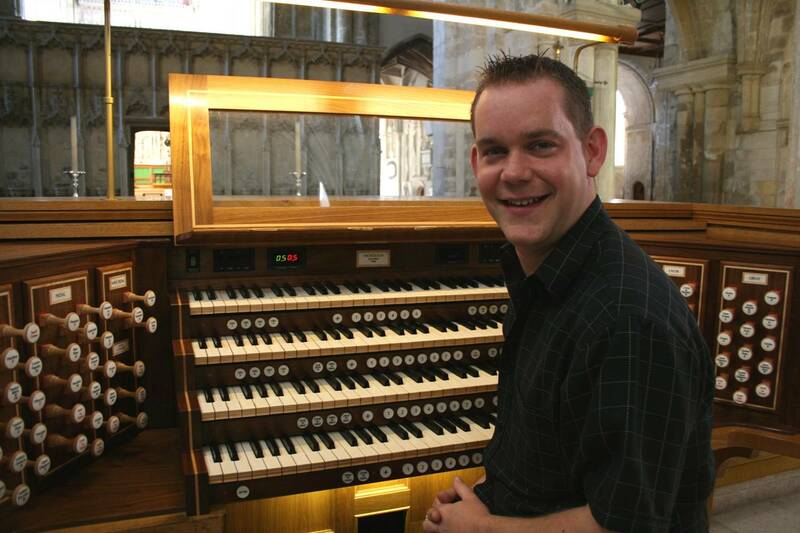 From September 1994-95 he was Organ Scholar at Lincoln Cathedral studying under Colin Walsh. In July 1997 he became a Fellow of the Royal College of Organists, whilst studying with Andrew Fletcher and Kevin Bowyer. From September 1997-98 Keith was Organ Scholar at Liverpool Cathedral under Professor Ian Tracey. The Cathedral houses the mighty 152 stop Willis Organ which is the largest Church Organ in Europe! As a recitalist Keith has performed throughout the Country including:- Liverpool Cathedral, Westminster Abbey, Alexandra Palace London, Rochdale Town Hall, Victoria Hall - Hanley, Hereford and Westminster Cathedrals and Symphony Hall Birmingham. Keith was in Guernsey in March 2003 and 2006 as both Recitalist and “Ambassador” in a very successful RSCM Children’s day. Keith has also been involved in two “Family Organ Days” at the Victoria Hall, Stoke on Trent. He has made a number of Radio and TV appearances , including BBC Radio 2 "The Organist Entertains" recent show marking Elgar’s 150th Anniversary. Keith has a number of recordings available on CD. Twice a year Keith is also responsible for producing the recordings for the aural tests, for the Royal College of Organists diploma examinations. In August 2007 for the RCO Keith recorded the sound track for “Dan and the Magic Musician”, an animation to inspire youngsters to take up the Organ. Keith is much in demand as a Concert Organist playing an increasing number of solo concerts a year here and abroad. Keith has twice been a guest Organist playing duets with the Pavarotti of the Organ the Great American Virtuoso Carlo Curley in his Christmas Concerts. In the summer of 2004, Keith Played three friendly “Battle of the Organs” concerts with Carlo in the Exmouth Festival, Pershore Abbey and at the Lavenham Festival and again in the fall of 2005. In July 2004 he played one of the IAO National Congress Recitals on the Isle of Wight at All Saint’s PC in Ryde. In July 2007 Keith appeared alongside Carlo Curley in the Kings Lynn Festival. This January saw Keith in Sweden playing duets in Gothenburg with Carlo and also in East Sussex. In April he was duetting with Carlo on the 28,000 pipe 6 manual Grand Court Wanamaker Organ at Macey’s Store, Philapdelphia, USA the largest working pipe organ in the world. His Concerts are wide and varied and are presented musically and verbally in a style that makes the Organ very accessible. Keith’s aim is to promote the art of Organ playing and help establish it in its rightful place as “The King of Instruments”. Keith also provides High Definition Big Screen Video Projection for a large number of Carlo Curley’s UK Organ Concerts, and at such venues as St Paul’s Cathedral, Westminster Cathedral, Royal Albert Hall, St Alban’s International Organ Festival & Lincoln Cathedral, St George’s Chapel Windsor.